What are foreign exchange markets? Markets exist across the world; from the pottery sellers of the Grand Bazaar in Istanbul to purveyors of leather jackets in London’s Camden Market. The foreign exchange market, however, is a different beast. Over US $5 trillion changes hands every day in a market that opens on a Monday morning in New Zealand, and doesn’t close until Friday evening in New York. In the FX markets, instead of goods, there are different types of currency trades with the majority of trades involving the US dollar. In fact, almost a quarter of all currency transactions that take place are traders exchanging euros for US dollars (and vice versa). The players and traders that make up this market are widely varied. From national central banks building up or selling their currency reserves to multi-national institutions buying or selling currencies on behalf of their clients. When these organisations conduct their transactions, they usually trade in very large quantities (in millions of dollars, as opposed to thousands!) which can have a significant influence on the direction of the market price. The price at which these trades take place is known as the interbank rate and it changes at an exceptionally rapid pace to meet the conditions of the market. Only central banks, multi-national banks and a few select others can access this price. The majority of developed world currencies are free-floating, meaning the value of that country’s currency can rise and fall against others as the markets see fit. 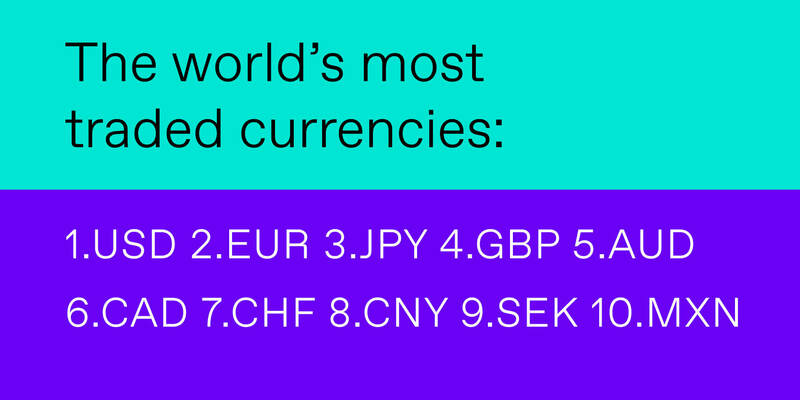 Of the world’s ten most traded currencies, nine of them are free-floating. Currencies can also be managed, or pegged, to other assets including precious metals or even another country’s currency. The Chinese yuan is a good example of a managed exchange rate; the country’s central bank sets an official price against the US dollar at the beginning of each day, and the currency is permitted to rise or fall a maximum of 2% from this price. Managed exchange rates can work to great effect in economies that are closely tied with economies abroad. Why do foreign exchange rates change? Exchange rates change for a wide variety of reasons with catalysts ranging from central bank activities, governments, private business decisions and, simply, speculation. Nonetheless, these so-called agents in the currency markets act in order to create, or respond, to incentives that play out through the value of exchange rates. Purchasing power parity is a tool used by economists to compare the relative ‘wealth’ (or lack thereof) of a particular country’s population across borders. The theory underneath all of this is that countries with a high level of inflation are effectively watching the value of their money decline which is then, in turn, reflected in exchange rates. 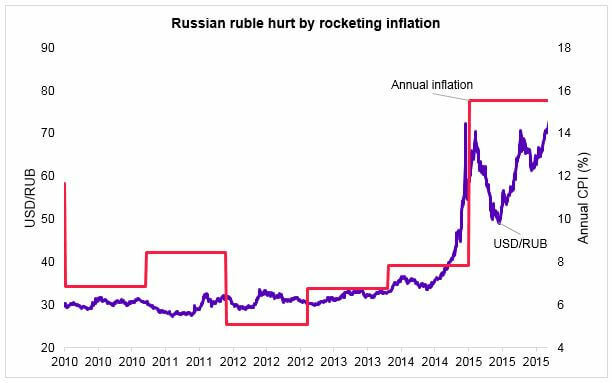 The value of the Russian ruble has closely tracked inflation rates in recent years, with a pick-up in price rises coming alongside a sharp fall in the value of the currency. 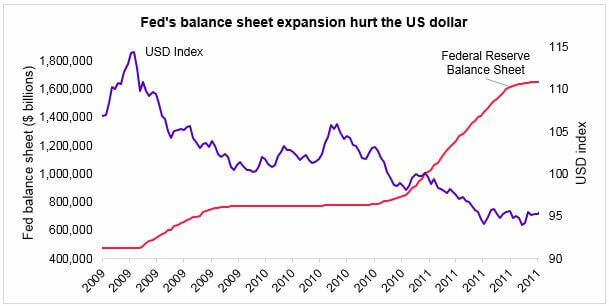 The expansion or constriction of money supply (literally, the flow and quantity of electronic and paper money in an economy) is a tool used by central banks and governments to control financial conditions. In the wake of the Global Financial Crisis, these tools were used liberally in an attempt to prevent liquidity in financial markets from dropping so low that the plumbing that underpins the global economy would seize up. One technique used by the Federal Reserve (among others) was quantitative easing – the purchase of assets from the economy using newly printed electronic money. This led to a rise in the Federal Reserve’s balance sheet, a compression of market interest rates and a fall in the value of the US currency. Another tool used by central banks to hit their economic targets is the humble interest rate. The rise and fall of interest rates can have a major impact on the value of the country’s currency in a very similar way to a current account; the higher the interest rate, the more attractive the currency account becomes. The best way to measure this is through the difference between two economies’ interest rates: thereby showing just how much higher or lower the rate of interest for one currency is above another. 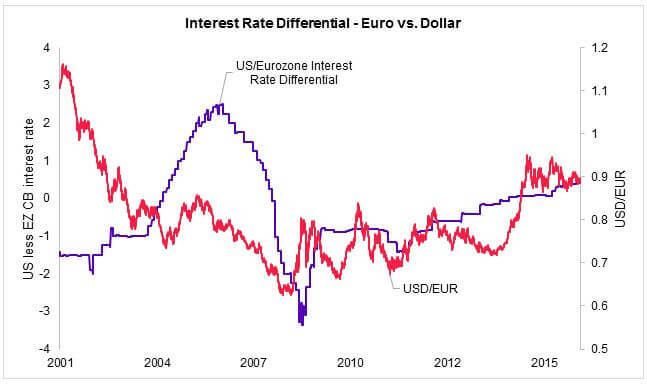 The higher the interest rate in one currency relative to another, the stronger that currency should be – as demonstrated in the USD to EUR rate following the Global Financial Crisis. The performance of a particular currency is closely allied to the behaviour of that country’s economy; if the economy performs well, the currency will often rise in tandem. As such, if a country is particularly dependent on the export of a commodity, the price of that commodity, gold for example, can often dictate the price of the currency. That’s the case for Brent oil and Canada, the world’s fifth largest producer of crude. 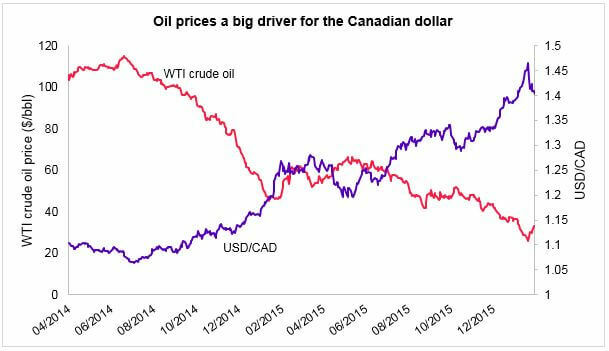 As the price of a barrel of oil plummeted in 2014, the Canadian dollar followed suit. When oil prices were up at $110 per barrel, one US dollar bought you one Canadian dollar and a few cents, but when oil prices dropped down in the $30s the Canadian dollar fell as much as 20%. From an investment perspective, the objectives are simple: place your money where you believe it will provide you with the greatest returns, at the lowest acceptable risk. As such, if a country is offering particularly good returns on investment (in this example, we’ve used bond yields), the currency may strengthen as investors shift their funds into that country. 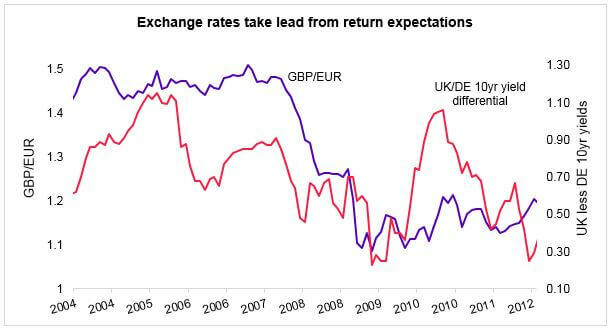 The GBP to EUR rate, as evidenced above, closely follows the difference between UK and German bond yields. Finally, another major influencer for exchange rates revolves around the theme of risk. It follows that the riskier (or more volatile) a currency is perceived to be, the weaker the associated exchange rate should trade. Above, we’ve used the VIX Index as an indicator for perceived risk – it takes into account the implied volatility of US equity prices according to a range of options contracts. Effectively, the higher the VIX Index goes, the more volatility markets expect over the coming 30 days. 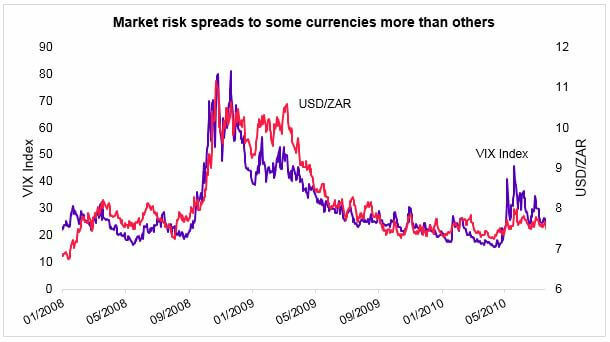 This perception of market risk is then reflected in so-called ‘riskier’ currencies such as the South African Rand (ZAR), which we’ve charted above. Who uses the foreign exchange market? As is the case in every marketplace, the price is dictated by two parties: the buyer and the seller. In currency markets, these roles can be taken up by a number of different parties: central banks, governments, financial institutions and independent investors (among others). These different parties will all have different objectives, goals and priorities when it comes to foreign exchange trading. One of the biggest differences in foreign exchange trading revolves around what the primary purpose of the underlying trade is. For many, including investment banks, proprietary traders and insurance firms, the buying and selling of different currencies serves no inherent purpose with the exception of profit. Outside of these speculative trades are the more traditional transactions; paying a supplier, buying a house overseas or repatriating foreign profits from countries far and wide. While the underlying purpose of the transaction will be different, the products and methods used to move currency and value across borders will be the same. Around 80% of all foreign exchange transactions are carried out by financial institutions – mostly notably banks and insurance firms. The rest of the 20% is a collection of hedge funds, proprietary trading firms and the so-called ‘official sector’ – governments and central banks. It’s not just economic data and financial developments that dictate foreign exchange markets and currency prices – but politics too. With polarizing governments, uncertainty surrounding global interest rates as well as one-off political shocks like Brexit, figuring out just which trend foreign exchange markets will follow next is a near impossible task. For small- to medium-sized businesses who lack the staff, time and manpower to monitor and follow the peaks and troughs of currency markets, making an international payment can be intimidating and time consuming. But, the opportunities available to SMEs looking to sell their products and services overseas can be significant. Our research last year showed that SMEs find, on average, that exports have boosted their profits by more than 20% and as such, not considering boosting your profile overseas could cut off this valuable source of profitable growth.